Updated Monday, Aug. 20, 11 a.m.
A roundup of major wildfires burning across California. Acreage and containment: Two fires, the River and Ranch fires, are collectively named the Mendocino Complex. The complex has burned 389,862 acres in Mendocino, Lake and Colusa counties and is 79 percent contained as of Monday, Aug. 20. On Monday, Aug. 7, it became the largest wildfire in California history, surpassing the Thomas Fire, which burned 281,893 acres in Santa Barbara and Ventura counties this past December before it was contained. On Sunday, Aug. 12, the Ranch Fire, burning southwest of the community of Potter Valley and north of Highway 20, on its own surpassed the Thomas Fire as the largest single fire in state history. It has now consumed 349,942 acres and is 74 percent contained as of Monday, Aug. 20. Officials now estimate the fire won't be fully contained until Sept. 1. The smaller River Fire has burned 48,920 acres northeast of the community of Hopland and west of the town of Lakeport, and was fully contained as of Monday, Aug. 13. Casualties: On Monday, Aug. 13, Cal Fire announced that a firefighter died while working on an "active portion" of the Ranch Fire. He was identified as Matthew Burchett, 42, of Draper, Utah. Damage update: At least 277 structures — including 157 homes — have been destroyed as of Monday, Aug. 20, and another 1,050 structures remain threatened. 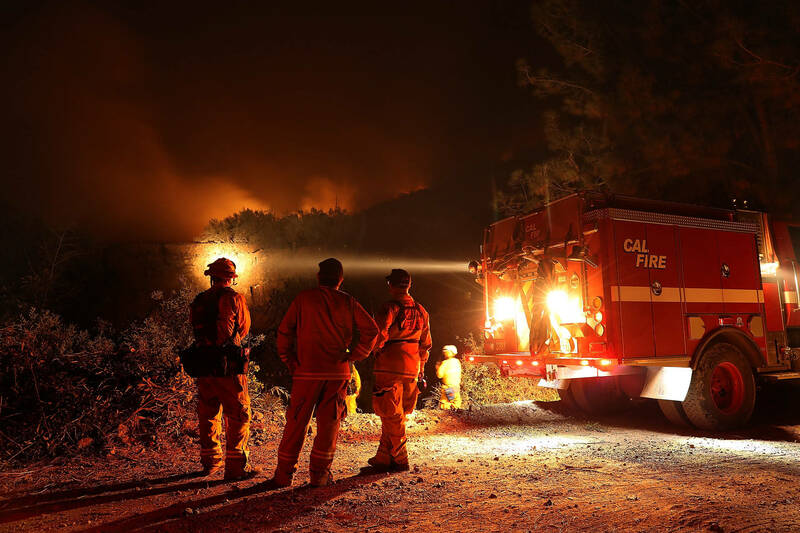 Evacuations and repopulation: See Cal Fire's Mendocino Complex information sheet for details on evacuations ordered in Mendocino and Lake counties. The Mendocino County Sheriff's Office is also providing evacuation updates on their Facebook page. Cal Fire is publishing repopulation notices on its Ranch and River fire information pages. Animal shelters: Horses are being accepted at Redwood Riders Arena at 8300 East Road in Redwood Valley, and small animals are being accepted at Animal Care at 298 Plant Road in Ukiah. You can contact the shelter directly at 707-463-4427 with any questions or concerns. Acreage and containment: The Carr Fire in Shasta County has burned 229,651 acres. The blaze was 88 percent contained as of Monday, Aug. 20. It is now the sixth-most-destructive wildfire in California history. Casualties: Three firefighters and four residents have died in the blaze. A PG&E employee was also killed while working to restore service to an area affected by the fire. Daniel Bush, 62, a resident of Keswick who was identified by the Redding Record Searchlight. Missing persons: Authorities in Northern California say all people reported missing in a massive wildfire have been located. Shasta County Sheriff Tom Bosenko said officials received 60 reports of missing people and that all had been located. Damage update: Cal Fire said 1,604 structures have been destroyed — including 1,079 homes — and another 279 structures have been damaged. No additional structures are threatened by the fire, according to Cal Fire. You can view a map with the most current structure information here. Evacuations and repopulation: As of Aug. 15, all the remaining evacuation orders had been lifted. Here's the latest list of repopulation plans from the Shasta County Sheriff's Office. You can view a map here. Cal Fire is also publishing repopulation announcements on its Carr Fire information page. Emergency shelters: All evacuation centers have now closed. There is, however, a disaster recovery center at the former K-Mart at 2685 Hilltop Drive in Redding. Shasta County and the city of Redding have created a disaster recovery website for rebuilding and relief information. Drinking water alerts: The California State Water Resources Control Board issued a boil water advisory for the Shasta community service district (west of Redding) water systems as a result of the Carr Fire. Customers in these areas should boil their water for one minute before using it for drinking or food preparation. The advisories for Clear Creek and Centerville were lifted. You can view updates to the advisory here. Acreage and containment: The fire just west of Yosemite National Park had burned 96,901 acres and was 100 percent contained as of Sunday, Aug. 19. It is now the largest fire in the Sierra National Forest's history. Yosemite closures: The Ferguson Fire prompted an extended indefinite closure of Yosemite Valley and other parts of the national park. It was the longest closure at Yosemite since 1997, when floods closed the park for over two months. Most of Yosemite Valley reopened on Tuesday, Aug. 14. Highway 41 and Glacier Point will remain closed for another week. Casualties: The fire has killed two firefighters: Brian Hughes, who died Sunday, July 29, after being struck by a tree, and Braden Varney, who died on Saturday, July 14, when his bulldozer tumbled down a mountainside. The fire has injured 15 others. Evacuations and repopulations: Federal incident managers have published a list of mandatory evacuations and repopulation notices on Inciweb's Ferguson Fire page. Evacuation center: Temporary evacuations centers have now closed. Animal shelters: For small animals, call the Central California Animal Disaster Team (CCADT) at 888-402-2238, ext. 700. Large animals are being accepted at the Mariposa County Fairgrounds at 5007 Fairgrounds Road in Mariposa. This post contains reporting from The Associated Press.